One thing that I’m going to try and do more of in ’09 and beyond is posting beer review features here on the ol’ blog. As a beer rating whore, I’m taking & typing up notes for all of the new beers I try, anyway (although I’ve currently got about half a notebook full that need to get entered). So while I won’t be posting here about every single beer I tip back, I’ll be aiming to do themed posts when I get a number of beers in the same style, or from the same brewery, etc. 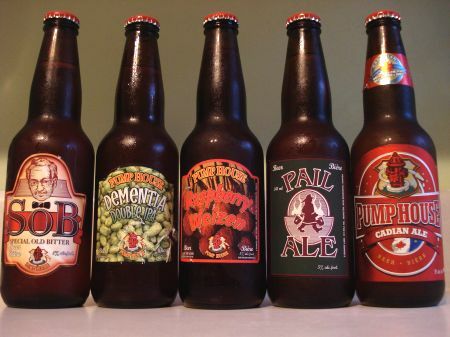 Which brings us to this li’l round-up of five beers from Pump House Brewery. My exposure to the beers from this New Brunswick brewery has been fairly limited, since only their Blueberry Ale has ever been available in Ontario, and even that was quite limited. But when the lovely and talented brewmaster Greg Nash headed there after being turfed from Garrison Brewing in Halifax, I made a point of trying to get my hands on more of their brews, and soon lucked into the five pictured above. Caramel-amber colour with a small off-white head. Aroma and flavour are both quite hop-forward, with strong grapefruit notes, and a sweet malt backing – simple, but very good. Medium bodied, and quite sessionable. Hazy dark golden with a small, lacy white head. Aroma – sweet sassy molassy, that’s HOPPY! Seriously, this is one of the hoppiest smelling beers I’ve ever come across. Big notes of citrus, pine, spruce, pot – crazy! Flavour is SLIGHTLY more subdued, but still pretty powerful. There is a sticky character to the body, but it’s also surprisingly crisp, especially in the finish, making it remarkably refreshing. Dark pink-amber with a minimal light pink head. Aroma and flavour are all about the raspberry – big and fresh, and really, really tart. Completely one-dimensional, but if you like raspberries (which I do), that one dimension is a really good one. Golden amber with a large white head. Aroma starts malty, with notes of chocolate and caramel, with citric and slightly woody hops coming up behind. Medium bodied with light carbonation. Flavour is great – mild caramel, candied orange peel, lingering hop bitterness. Solid! Light gold colour. Sweet & grassy malt aroma. Light body. More sweetness in the flavour, with a bit of honey & orange. Not much bitterness in the finish. The most mainstream – and most disappointing – of the bunch. I’m sure my tens of readers will be happy to know that I’m still alive. I’ve just been even more busy and/or disorganised than ever these past few weeks. Hence the continuing lack of posts. I couldn’t miss a Session, though. If I did, they might take away my membership in the sooper-seekrit beer bloggers cabal or something. The theme of this month’s edition – as chosen by the poetically-inclined Captain Hops at Beer Haiku Daily – is Beer and Food, which gives me the incentive to finally get around to posting about an interesting tasting I hosted a couple of weeks ago in a somewhat unlikely location. My wife and I are not a romantic couple. We love each other dearly, and we look forward to spending the rest of our lives together, but we don’t go for all the lovey-dovey hearts-and-flowers crap that many couples thrive upon. Valentine’s Day is completely ignored in the Clow-Kirby household, and birthdays are generally celebrated with a small group of friends at a comfortable restaurant rather than with some elaborate, overpriced candlelit dinner-for-two at a pretentious, overrated bistro. As for New Year’s Eve – well, not only are we not romantic, but we’re also somewhat misanthropic, so the idea of joining the teeming masses and wearing stupid party hats while drinking crappy sparkling wine at midnight just isn’t that appealing to us. Since NYE is also our wedding anniversary, we have gone out for dinner a couple of times to mark both occasions (yeah, we’re not completely cold-hearted), but we’ve always stuck with early seatings in order to be home well before the ball drops. For the past couple of years, though, we haven’t even bothered with a dinner out, and instead we just order in from one of our favourite Indian restaurants and spend the night in front of the tube – this year’s selection included downloaded episodes of Little Britain Abroad, Kitchen Nightmares and No Reservations. Our one nod towards the celebratory nature of the night was opening one of the bottles of Kuhnhenn Raspberry Eisbock that I picked up at the brewery back in August. This was my first time trying this renowned elixir, and I was actually a bit disappointed by it, especially considering how much I paid for these li’l bad boys. It poured a murky looking ruby-brown with a very still body and a faint wisp of a tan head – not that appealing looking, to be honest. The aroma was worrisome at first – some nice chocolate & caramel, but also seeming quite stale. Whatever it was cleared after a few moments, and it became much more pleasant, developing notes of raspberry and sweet alcohol. Body is soft and smooth, very nice. The flavour is pleasant, with nice notes of chocolate, toffee, raspberry, licorice, and some slightly woodiness, but it didn’t knock my socks off. It’s a very good beer, no doubt about that, but it simply didn’t live up to the hype for me. Anyway, cynicism and slight disappointment aside, I really did enjoy my typically atypical New Year’s Eve, and I hope that you also enjoyed yours, no matter how you chose to celebrate it (or not). While it started out a little rough, 2006 ended up being a pretty good year for me, and here’s to 2007 being a good one as well, for all of us.